Who is leading the plan? What is the 21st Century School Master Plan project? create a facilities/site plan that addresses a number of structural/functional, operating cost/energy efficiency, health/safety, and programmatic challenges associated with a 1950's era school; respond to fundamental changes in learning and teaching during the last 5 decades to best prepare our students for a changing world; and, inspire students and faculty to excel. Immediate Facility Deficiencies – It is not surprising that a building constructed in 1957 (with a 1960's addition) built with a functional lifespan of perhaps 30 - 40 years, has 50+ years later outlived its useful life. The dated facility is maintained by an active and thoughtful facilities department and committee. With limited financial resources, they and past boards have kept the school up and running well beyond the typical lifespan for such a facility and without state funding mechanisms to re-invest in major capital projects. However, given the age, design and construction techniques of the facilities, there are a number of pressing facility issues which have health and safety, programmatic as well as operating cost implications that now require a long-term solution. New Paradigm in Learning and Teaching (Since 1950/60's) - In addition to the structural/facility/operating issues that need to be addressed, the building, as a traditional post-war corridor school was designed for the teaching and learning methods of the time. During the last 50 years, those methods and ways of learning have changed substantially such that the sizes, layout and relationships of most of the spaces within the current school are obsolete. The spaces in today’s schools, are flexible and student centered; foster collaboration and connectivity; make learning visible; include small and large breakout spaces; facilitate integration of content areas; facilitate connectivity to the outdoors, and make students, staff, faculty feel confident, safe, empowered proud and positive about their learning environments. An Opportunity for Economic Development and Securing the Long-Term Future of Our District’s Communities - Apart from addressing the health and safety issues and operating inefficiencies associated with an aging facility, there is a opportunity given the school’s site, location and quality of program/faculty/staff to leverage the development of a modern facility to address core sustainability issues facing our state and region. It is well documented that good schools help communities attract and retain the best teachers, play a significant role in bringing young adults back to the area, attract new and benefit existing businesses. An explicit goal within our community and as advanced by Governor Scott is attracting young families to the State. The blunt reality is that this is difficult to do without school facilities that are current and forward looking. A future ready (and ideally leading) school (with forward looking curriculum and facilities) located on 30+ acre riverfront setting in Woodstock, VT has the potential to attract new residents, increase tuition paying students and be a catalyst for economic development - securing our future for the next 50 decades and beyond. Further, a modern school can have positive outcomes for student achievement, attitudes, behavior as well as faculty and staff performance and satisfaction. To date the process has involved developing an initial vision and goals; completing a comprehensive assessment of the existing facilities by a team of architects, engineers and other specialists; visiting exemplary schools, reviewing case studies and educational visioning workshops with faculty, staff, board and students; and, preparing assessments of current and potential future space needs/allocations. Fire Safety: The middle/high school lacks a sprinkler/ﬁre suppression system throughout. Without sprinklers, the entire school must adhere to a much more stringent Fire/Building Code criteria – including requiring classroom doors to be closed at all times – limiting air circulation and connectivity to others in the building and prohibiting the display of student work in school hallways. Structural Issues: The existing building was built before seismic codes were enacted, and the Middle School construction does not meet current structural code requirements. In addition, the current roofs in both the MS and HS were not built for current snow and drift load requirements. 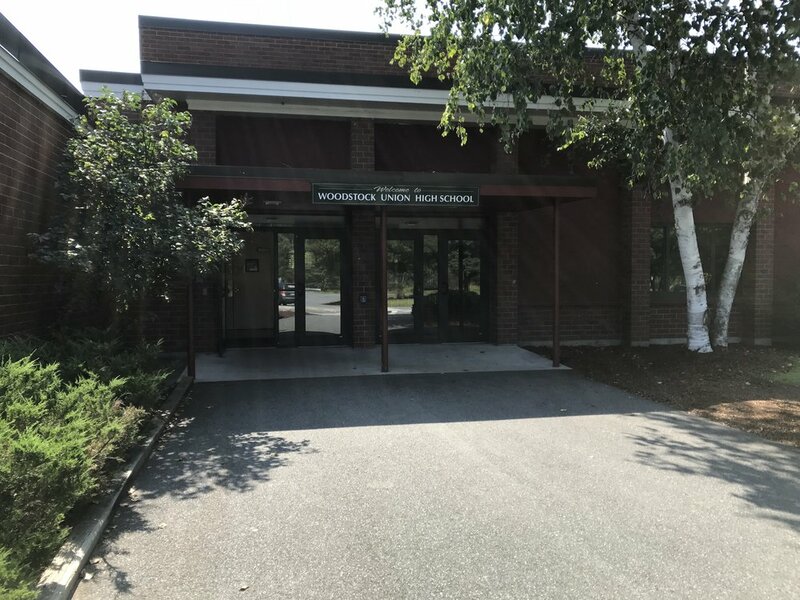 Security: School security has changed dramatically over the past decade (particularly in the wake of Sandy Hook), and the design of WUMHS does not reﬂect these current security standards. Healthy Indoor Air Quality: There is an overall lack of proper ventilation, air circulation and healthy air quality. Most of the classrooms have unit ventilators which are loud, inefficient, open directly to the exterior, and provide poor air distribution. This results in both poor air quality and temperature extremes, which in turn seriously aﬀects the ability of students to learn and faculty to teach. Energy Efficiency: The existing building cannot be consider high performance due to its age and will never operate at the efficiencies of a modern facility. There are continuing issues with the seals of replacement windows, sills and entry doors. The existing steam heating system and circulation system is inefficient and beyond its useful life. Vehicle Circulation: At present there is not a clear, safe delineation between pedestrian and vehicular (car and bus) circulation on site resulting in hazardous pedestrian conditions. The experience of arrival on site and into the school is also neither inviting nor clear. 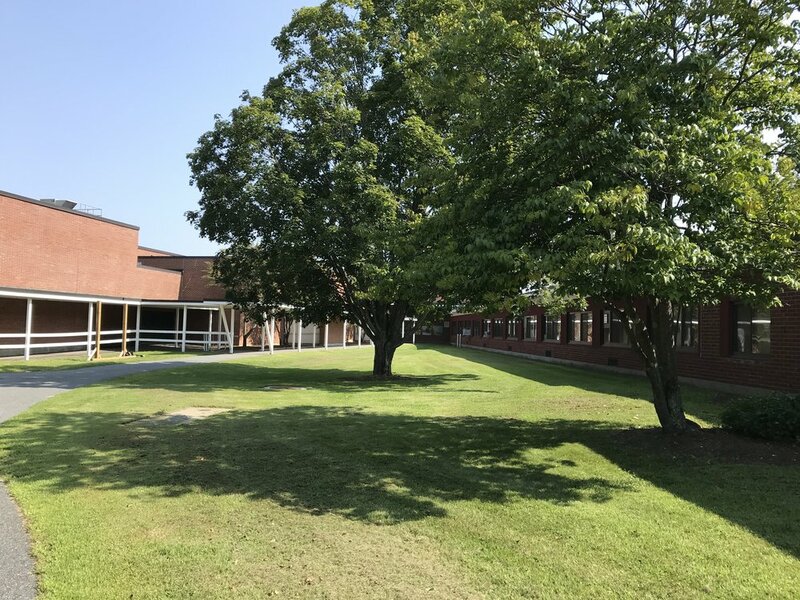 In addition, consideration should also be given to the creation of better emergency access around the facility, and improving connections to the athletic ﬁelds and river. Athletic Fields and Grounds: Athletic fields are not optimally configured for best use. Campus is not oriented for car and pedestrian circulation and spectator space and comfort. Fields lack adequate drainage and are prone to overuse. The campus lacks a traditional football field/track combination as well as a synthetic turf field to allow for early spring outdoor sports practice. Site Orientation and Connection of Building to Outdoors: The high potential riverfront site is underutilized with an inefficient layout. The school building is not sited well for solar orientation or surrounding views and has little purposeful relationship to the natural features of the site - river, woods, wetland. Building/ADA Codes: The school does not adhere to many ADA/Building Code requirements at stairways, bathrooms, water fountains, room signage, door hardware, etc. Sustainability: While a number of classroom based sustainability initiatives have been implemented by students and faculty, there are many sustainability features typical of modern buildings that could be incorporated into the facility to make it healthier and more productive for building occupants, and less costly to operate. Vision - During a two-day period, 25 Windsor Central Supervisory Union High School and Middle School and WCSU administrative leaders, teachers,administrators, students, parents, and community partners, participated in Educational Visioning Workshops run by New Vista Design and Lavallee Brensinger Architects. The workshop was a collaborative session designed to inform the WCSU 21st Century School Master Plan. Participants were led through a step-by-step visioning process aimed at capturing their best thinking about the district’s current and future educational goals and priorities, and connecting them to best practices and possibilities in innovative school facility design. The result of the workshop was a comprehensive vision for a 21st Century learning environment. A safe, open, day-lit, flexible and collaborative Learning Environment, welcoming to the whole community; with proper adjacencies, student display, healthy, energy-efficient systems, integrated technology, high performance construction and connected to the site and natural resources. New/enhanced playing fields including a multi-sport turf field. Safe, Welcoming and Clear Vehicular and Pedestrian Circulation and Access to the Site. The master plan team is evaluating several conceptual options for best addressing the challenges identified including renovations and new build options or a combination of both. After an extensive interview process, a team of design and education professionals (including an educational planner, architect, landscape architect, several engineers) was retained to lead a the master plan process. The Master Plan team is led by Leigh Sherwood (of Lavallee Brensinger Architects (and formerly of OMR) with 30 + years experience, specifically with K-12 schools. Other team members include Jack Rossi, VT based Landscape Architect, David Stephen, Leading Educational Programmer (co-founder of High Tech High and consultant to leading schools) + a Structural Engineer, Cost Estimator, Local Civil Engineer, Mechanical/Electrical/Plumbing Engineer. This Master Plan team is being managed by a committee of the WCUD (Woodstock Central Union District) Board and guided by best practices in educational facility design today.